I made this card for my honey's birthday, which was last Saturday. We don't usually exchange gifts, so I like to go all out for his birthday cards. I saw this card as part of last week's Try a New Technique Challenge on Splitcoast. These tri-shutter cards look really complicated, so I was a little nervous to try it, but they are deceptively easy to make. 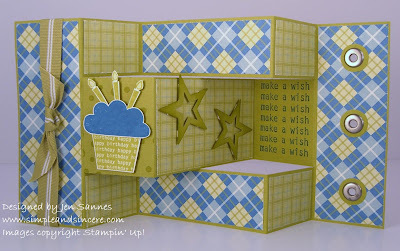 You can view a tutorial by Bonnie Szwalkiewicz here. Here is a top view of the card. I love how all those panels fold in and out. I got to use my Score-Pal on this project and it came in very handy. I received one for my birthday from my wonderful stamping friends in the Creative Consortium, but haven't used it much. I was glad that I could put it to good use! I used my Big, Bold Birthday stamp set and cut out each of the pieces of the cupcake and the candles, mounting them on the mid-left inner panel. I added a couple of stars, which I double punched with the Star punch and the Large Star punch. A little tip - first, punch out the small star out of your piece of scrap and then punch the larger star, creating a frame. Much easier than trying to do it the other way around! I sponged a little bit of Kiwi Kiss ink around the edges of the stars, giving them a little more dimension. What a super card Jenn! I love everything about it especially the color combo! The pictures are great. Dang, this is cute...every single one I've seen is awesome! On my "to-try" list! Wow, how awesome it that! And lots of options for a fun masculine card. I am so going to case this card! What a fun way to use coordinating DSP!